Goa, May 18, 2018: Vice Admiral Girish Luthra, PVSM, AVSM, VSM, ADC, Flag Officer Commanding-in-Chief, Western Naval Command, said today that maintenance and repair of any aircraft using latest and hi-end technology is the life-line of Naval Aviation fleet, and Indigenisation efforts to ensure that the right spare is available at the right time must begin much earlier in the life cycle of a platform after its induction. Speaking at the inauguration of the two-day “Aviation Indigenisation Expo 2018” organised by FICCI in association with the Indian Navy and the Aeronautical Society of India, Goa, he said, “This will not only reduce the aircraft down time as majority of components are still import dependent, but will also result in lower cost of repair and maintenance”. 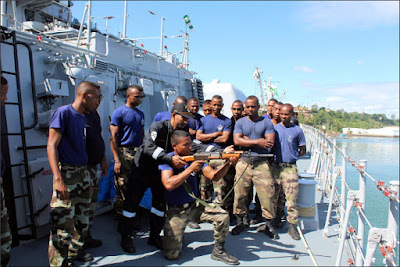 He further added that while the Naval Aircraft Yards and Station level workshops have been meeting the challenges, there is a need to encourage OEMs (Original Equipment Manufacturer) to set up facilities and carryout repair up to module level. 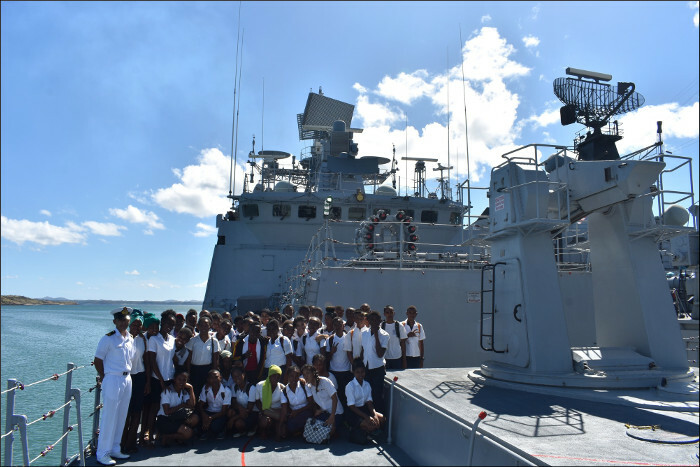 The Expo has twenty displays, with the Navy displaying their aviation indigenisation requirements, and Indian industry showcasing their indigenisation solutions. 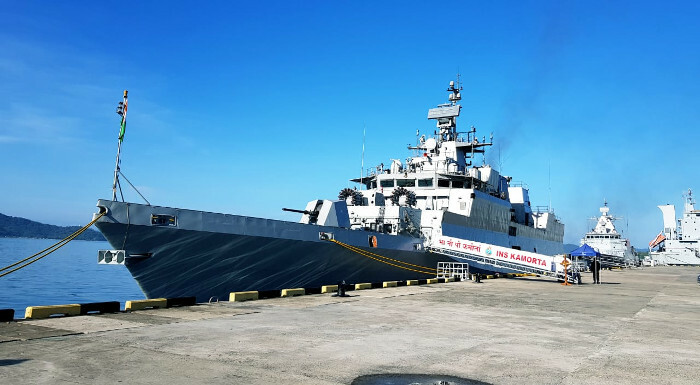 Concurrent to the Expo, technical papers on Maintenance of Naval Air Assets were presented by Foreign OEMs, Indian Industry and Certifying agencies. Significant interest was shown by the industry in Naval Aviation Indigenisation stalls put up by the Indian Navy, displaying the proposed aviation spares and items to be indigenised in accordance with ‘Naval Aviation Indigenisation Roadmap’. Stalls by MSMEs are witness to the efforts put in by the Indian defence industry to achieve self-reliance through innovation and indigenisation in accordance with the Government’s ‘Make in India’ initiative. 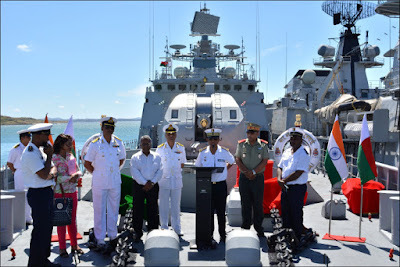 The inaugural session saw the presence of Rear Admiral Philipose G Pynumootil, NM, Flag Officer Naval Aviation (FONA) and Flag Officer Commanding Goa Naval Area (FOGA); Rear Admiral V Mohan Doss, VSM, Assistant Chief of Naval Staff (Air Material); Cmde. Mukesh Bhargava (Retd), Vice President L&T Ltd. from FICCI; Vice Admiral G Ashok Kumar, AVSM, VSM, Deputy Chief of the Naval Staff; Commodore Sanjeev Dureja, Superintendent, Naval Aircraft Yard (Goa) and Chairman, AeSl Goa branch. The Expo was attended by Flag Officers, Senior Officers, Officers of Tri-Services, Cmde Sujeet Samaddar (Retd. 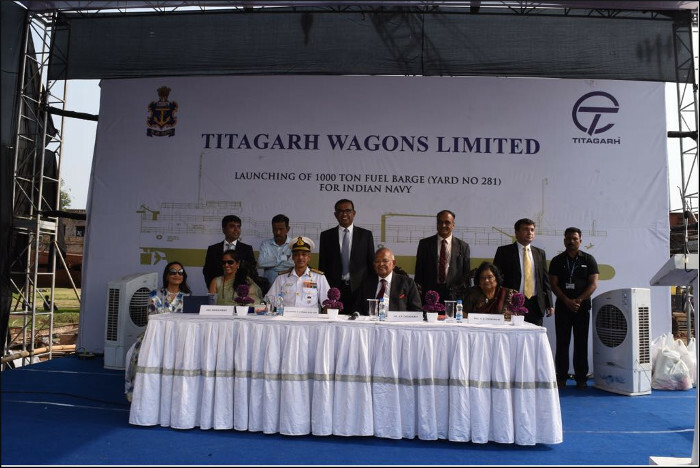 ), Officials from NITI Aayog, HAL, CEMILAC, foreign OEMs, Indian Industry and Indian Navy personnel of Goa Naval Area. Towards the end of the opening day, a guided industry tour of the Naval Aircraft Yard (Goa) and HANSA was conducted to familiarize the industry with major indigenisation items displayed at the Aviation Indigenisation Gallery and Air Station Hangers. Raksha Rajya Mantri Dr. Subhash Bhamre is on a three-day official visit to Republic of Nauru from 16 May 2018. He attended the 50th anniversary celebrations of its Constitution Day on 17 May 2018 as the Chief Guest. On his maiden visit to the country, Dr Bhamre was introduced to the Nauruan Cabinet by the President Mr Baron Divavesi Waqa followed by a detailed meeting chaired by the President. During this meeting, wide-ranging discussions were held covering the entire gamut of bilateral relationship and specific subjects concerning the respective ministries of the government of Nauru were discussed to further enhance and deepen the existing excellent bilateral relations between the two countries. The two sides discussed projects relating to Climate Change, Renewable Energy, Health, Education, Capacity Building, Infrastructure etc. President Waqa hosted a State Banquet in commemoration of Nauru’s Constitution Day. Dr Bhamre, in his speech, hailed the wise and farsighted leadership of President Waqa and called India and Nauru as “friends, who have transcended the geographical barriers of great distances and have come together to jointly face the common challenges”. The RRM later presented a copy of the Indian Constitution to President Waqa, with compliments of Prime Minister Shri Narendra Modi. President Waqa thanked and conveyed his gratitude and warm personal regards to the Prime Minister of India. Dr Bhamre declared that “two countries intend to take this cooperation and these bonds of friendship to even greater heights under the able stewardship of our two great leaders – President Waqa in Nauru and Prime Minister Modi in India”. Nauru will be hosting the 49th Pacific Islands Forum Leaders Meeting in September 2018 and Dr Bhamre conveyed that India will be offering 22 Mahindra SUVs and two Tata buses worth $ 706,000 to Nauru as per their request for this meeting. 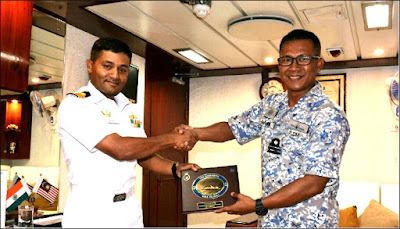 Dr Bhamre visited Nauru’s Rehabilitation Corporation, Nauru Port Authority to see the port facilities and Nauru Police Force Headquarters. India earlier supported Nauru with police uniforms for the Nauru Police Force on the occasion of the 50th Anniversary of the Independence of Nauru on 31 January, 2018. The RRM interacted with the small Indian community in Nauru over Lunch. Dr Bhamre assured Government of India’s steadfast commitment to Indian citizens and persons of Indian origin wherever they are in the world. Indian Naval Ships Trikand and Mumbai visited Antsiranana, Madagascar. 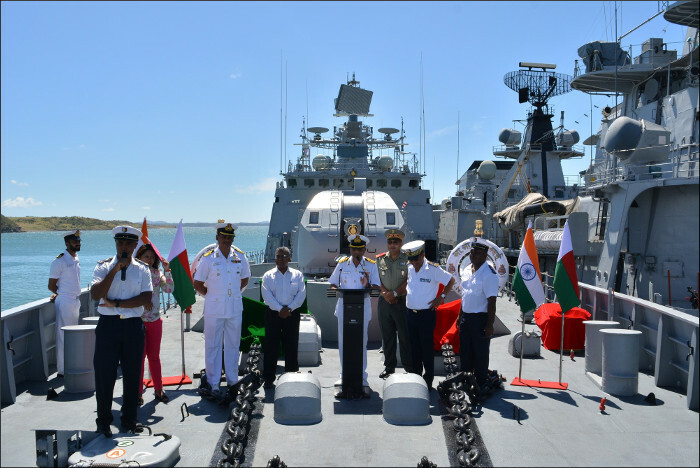 As part of the visit, HE Shri Subir Dutta, Ambassador of India to Madagascar along with the Commanding officers addressed a press conference onboard. 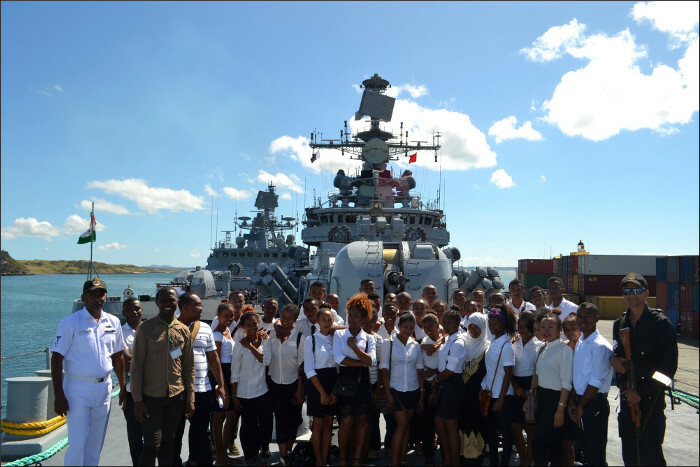 The ships conducted community service at Municipal Hospice, Antsiranana and undertook general maintenance, painting and cleaning of the premises. Community service and a medical camp were also undertaken at Cap Diego Village, wherein patients were screened for diabetes, hypertension, cataract and upper respiratory infections. The ships were open to school children and Malagasy Armed Forces personnel. 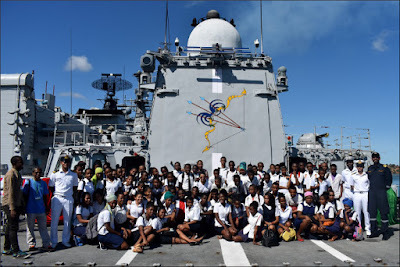 A reception was hosted by the Indian diaspora for the visiting crew, which was attended by HE Shri Subir Dutta, Chief of Malagasy Navy and representatives of the prefecture in addition. 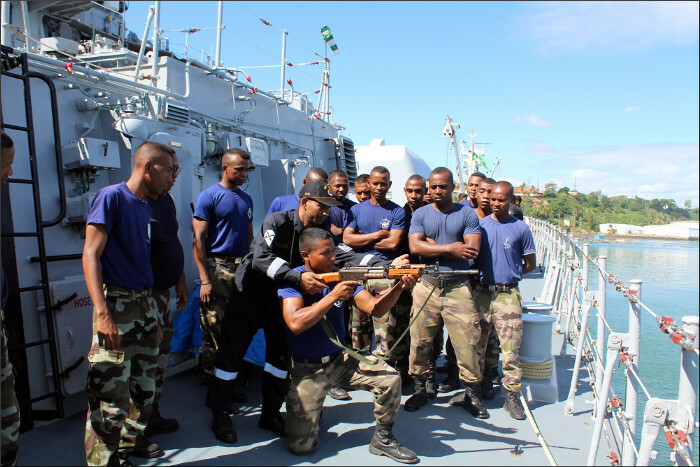 Five officers and three sailors of the Malagasy Navy embarked INS Trikand for sea training and experience and were exposed to bridgemanship, force protection measure drills, helicopter and VBSS operations. The first of the two 1,000 ton fuel barges being built for the Indian Navy by Titagarh Wagons Ltd, Kolkata was launched on 17 May 2018. 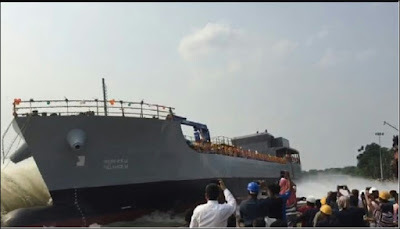 Vice Admiral MS Pawar, Chief of Staff Eastern Naval Command was the Chief Guest for the launching ceremony and Smt Meena Pawar formally launched the Barge in accordance with naval traditions. The barge is 68 metres long, has a displacement of 2,000 tons and is designed to replenishing LSHSD, AVCAT, Fresh Water and other oils to warships in harbour and at anchorage. It is capable of speeds upto 12 knots and has an endurance of 500 nautical miles. The vessel has a collapsible mast, which will enable her to berth alongside an aircraft carrier catering to the large overhang of the flight deck. 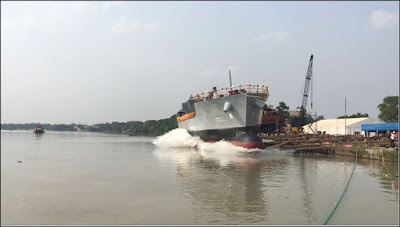 Speaking on the occasion Vice Admiral Pawar complemented the shipbuilder for launching the vessel ahead of schedule and expected that the barge will be delivered to the Indian Navy as scheduled. In pursuance of India’s Act East policy, Indian Naval Ship Kamorta visited Kota Kinabalu, Malaysia. The visit sought to enhance maritime cooperation and bolster India’s strong bonds of friendship with Malaysia. The ship participated in a Passage Exercise with Kedah-class offshore patrol vessel KD Terengganu of Royal Malaysian Navy on departure from Kota Kinabalu with the aim to enhance interoperability, share best practices and develop bridges of friendship between the navies.